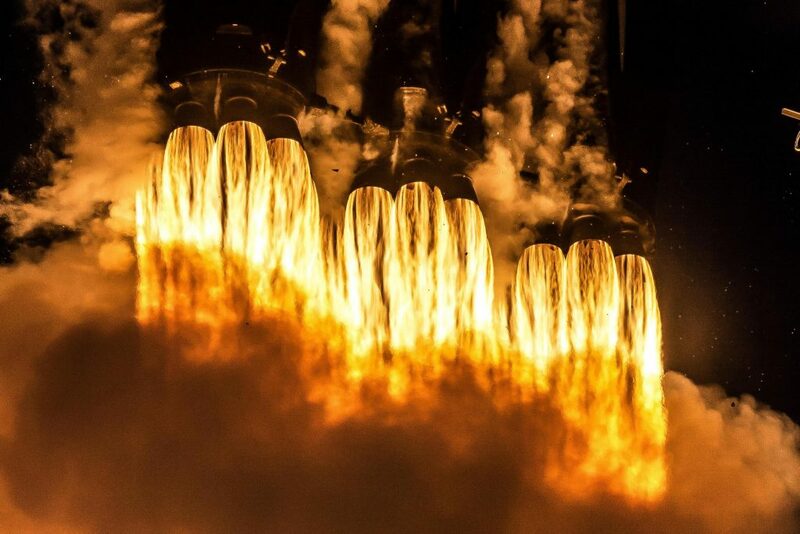 Teslarati photographers Tom Cross and Pauline Acalin were both on the ground with more than eight cameras split between them, many of which were able to capture some spectacular photos of the world’s largest rocket throughout its flawless commercial debut. Perhaps most notable are photos and videos from those with cameras (or job sites) near SpaceX’s Cape Canaveral Landing Zones 1 and 2, in some cases producing videos of the multiple sonic booms produced by Falcon Heavy’s side boosters during the transition from hypersonic to subsonic speeds. Both Teslarati photographers produced some amazing photos over the course of setting up cameras to capture Falcon Heavy and observing its commercial launch debut from approximately 7 miles (11.3 km) away. 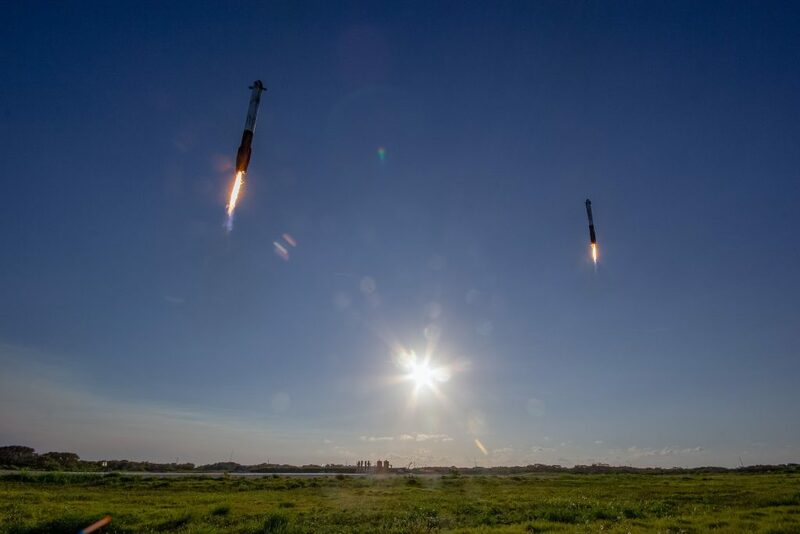 This included distant shots of Falcon Heavy during all visible stages of flight, including liftoff, ascent, side booster separation, and both side booster landings. 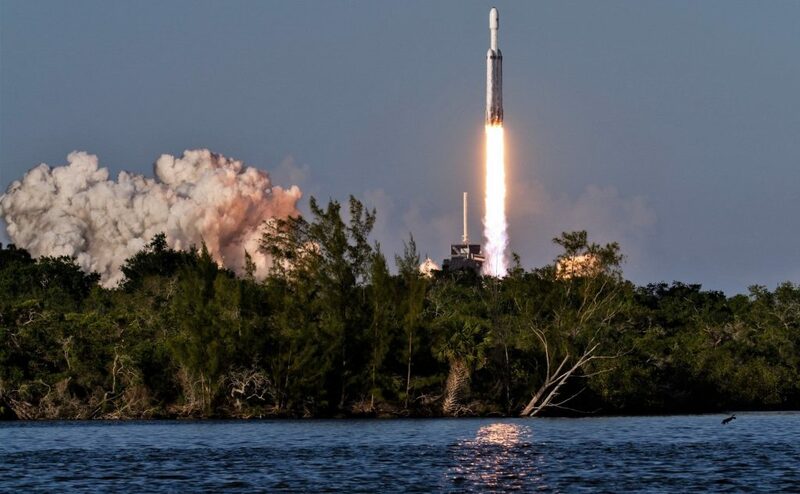 SpaceX’s own official remote cameras then joined press photographers like Tom and Pauline to capture Falcon Heavy’s Pad 39A liftoff from a distance that would likely maim or kill a human standing in the same position. Triggered to snap photos by the actual sound of the rocket launching, these cameras can capture views that would otherwise be nearly inaccessible. 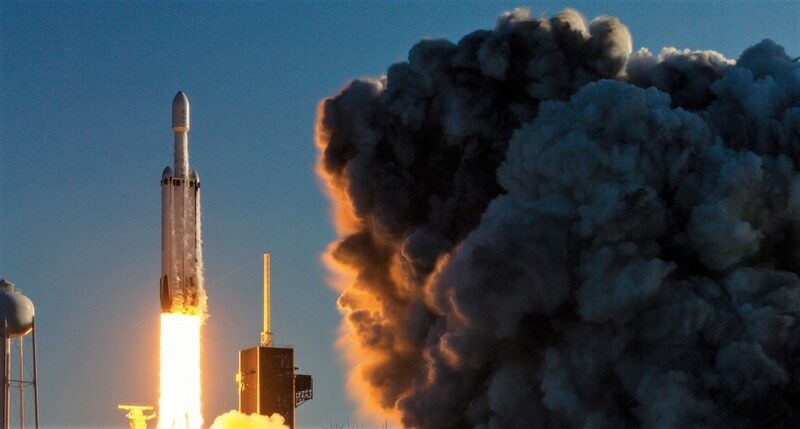 At liftoff, Falcon Heavy Block 5 likely produces anywhere from 5.1-5.6 million pounds of thrust (23,000-25,500 kN) that is immediately countered by a huge deluge of water used to prevent the sheer sound of its Merlin 1D engines from damaging themselves or other parts of the rocket. This ends up producing spectacular clouds of steam, often an iconic feature of most rocket launches. Falcon Heavy is currently the most powerful operational rocket in the world by a factor of ~2.5 and will hold on to that title until NASA’s SLS rocket debuts, likely no less than ~48 months away. Finally, there are the photos and videos of Falcon Heavy’s side booster recovery. Aside from a select few photographers working for SpaceX or the Air Force, as well as Cape Canaveral AFS and Kennedy Space Center employees, the closest a member of the press can get to one of SpaceX’s Landing Zone Falcon recoveries is around four miles (6.4 km) away. Photos (and the aural experience) of Falcon landings from four miles away are still absolutely spectacular, but they can’t compete with the privileged access described above. One such video taken by a United Launch Alliance (ULA) engineer offers an extraordinary up-close view of both Falcon Heavy Block 5 side boosters – B1052 and B1053 – safely returning to Earth after their first operational launches. Likely standing near the top of ULA’s LC-37 Delta IV launch pad integration facilities, Mr. Krishnan’s video does an excellent jobof capturingthe excitement of experienced observers, as well as the bone-rattling power of the sonic booms Falcon boosters produce in the process of landing. Of note, the extreme roar and crackling of each Falcon Heavy side booster’s landing burnisperformed bya singleMerlin 1D engine, of which both havenine. Located less than 3.5 miles (5.6 km) away from SpaceX’s Landing Zones, this is a perspective that very few humans will ever experience, owing to the fact Cape Canaveral Air Force Station is an operational military base and that being so close undeniably adds some level of risk for observers. In the author’s humble opinion, the view seems… worth it. LC-37 also happens to be just 5 miles (8 km) away from the LC-39A pad from which Falcon Heavy had just launched, thus offering an almost equally visceral view of liftoff, ascent, and landing. 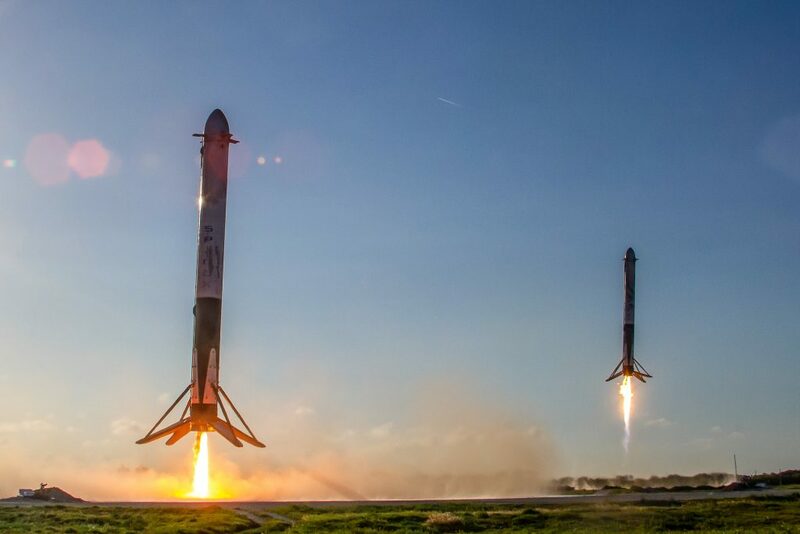 Cameras placed near the Landing Zones by both SpaceX and USAF photographers captured even more spectacular views and marked the conclusion of the launch and landing debuts of Falcon Heavy boosters B1052 and B1053. These same boosters are tentatively scheduled to support Falcon Heavy’s third launch as soon as June 2019, potentially breaking SpaceX’s internal record for time to complete a given booster’s refurbishment (72 days for Falcon 9, 74 days for Block 5). 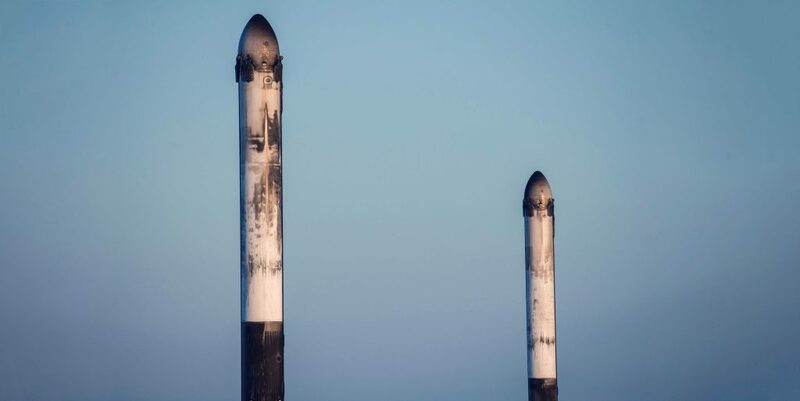 However, once Falcon Heavy Flight 3 is completed sometime later this year, it’s possible that SpaceX will replace their nosecones withinterstagesand return the rockets to the active fleet of Falcon 9 boosters, something made possible by design changes incorporated in the Block 5 upgrade.